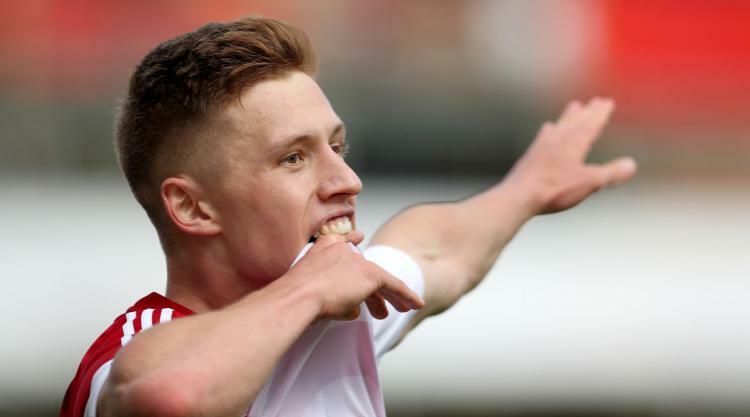 Greg Docherty proved himself to be Hamilton's saviour as his strike sealed Accies' Ladbrokes Premiership survival and consigned Dundee United to 12 more months in the Championship. The 20-year-old Accies midfielder handed his side a crucial 1-0 win when he rifled home midway through the second half of the play-off decider at the SuperSeal Stadium. That precious strike stretches the Lanarkshire outfit's top-flight stay to a fourth year, but it could yet have grave consequences for cash-strapped United. The Tannadice outfit's auditors have already admitted there is "material uncertainty" over the club's status as a going concern after they suffered losses of Â£1.55million following relegation last year. Under-fire chairman Stephen Thompson insists there is no danger of the club slipping into administration, but the prospect of boss Ray McKinnon being able to put out a promotion-winning squad next season appears faint. The hopes of both sides hung in the balance following the goalless first leg at Tannadice and there was an understandably tense atmosphere as the return got under way. Keeper Remi Matthews did well to settle Hamilton nerves when he pushed away Tony Andreu's opening effort just five minutes in. And it was patched-up Accies - missing the injured duo Michael Devlin and Massimo Donati as well as suspended battler Darian MacKinnon - who settled quicker into something resembling a rhythm on the sticky plastic pitch. It was not pretty but they had a clearer idea of what they were looking to do than United, whose narrow midfield diamond too often found itself lost for options. The visitors twice found themselves under self-inflicted danger when Willo Flood and Charlie Telfer gifted away possession and had keeper Cammy Bell to thank for denying Ali Crawford on both occasions. The one-on-one battle between the United stopper and Accies playmaker resumed again on the half-hour mark as Danny Redmond's free-kick broke off the wall to Crawford 18 yards out. His dipping shot seemed destined for the bottom corner until Bell threw himself low to brilliantly palm away with one hand. Matthews was just as alert late in the half as he reacted impressively to keep out a Charlie Telfer cross deflected towards the angle of his goal-frame by Accies full-back Scott McMann. It was Bell again to the rescue for United after the break as he blocked Dougie Imrie's attempt at the back post. But there was nothing the former Rangers stopper could do after 64 minutes as Docherty collected 25 yards out before rifling a low shot through the legs of Flood into the bottom corner. The Hamilton faithful inside New Douglas Park erupted with joy while a look of dread spread across Tangerine faces. With so much riding on their promotion hopes, United threw themselves forward but were frustrated when Simon Murray - freed to play after United appealed the double-dive red card he received on Thursday - blazed over when through on Matthews. McKinnon pushed centre-back Mark Durnan up front in a desperate last throw of the dice but there was no late drama as Hamilton held on.